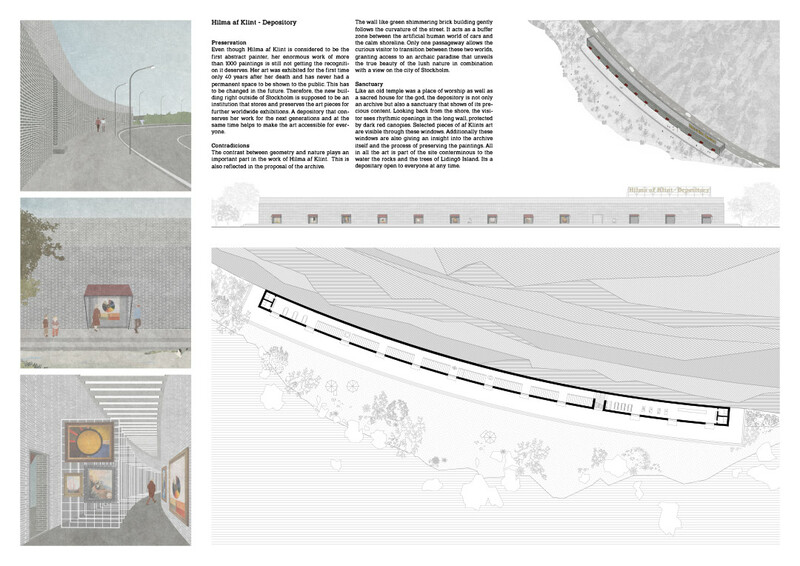 JURY’S COMMENTS: A successfully represented “archive museum” concept. Even though specific thought hasen't been given to each category and cycle in af Klint's substantial body of work, it presents a convincing thought on how this collection may live on in the near future, and the proposal excellently translates Hilma’s hybrid art movement into architecture. The presentation shows how the massing and form of the architecture translates into a symbol of the breadth and signficance of the artist and her collection. The curvature of the shoreline and position of the road dictates the shape of the museum without it feeling forced: the narrow building almost forces the visitor to always experience the art in the same way. The illustrations give a wonderful sense of space vibe and have an aesthetic quality, even on their own.